This field trip is made possible by the Inland NW Land Conservancy. We will be birding Bear Lake Regional Park as well as the private property of Vicki Hershey that contains nearby Owens Lake. Contact leader Curtis Mahon by texting to (509) 710-3409 or c9r0m0@gmail.com by April 25th to reserve your place. We will meet at the upper parking lot of Bear Lake at 8am. Bear Lake is about 25 miles north of downtown Spokane off of Highway 2. This is a mostly easy 3 mile hike round trip with a couple steep sections. The trip should last 3-4 hours. Target Species: A variety of waterfowl and raptors, Common Loon, Ruffed Grouse, Bewick’s, Marsh, and Pacific Wrens, Virginia Rail, Sora, Red-necked Grebe, Wilson’s Snipe, Townsend's Solitaire, Yellow-rumped and Yellow Warblers, Calliope Hummingbird, Say's Phoebe, Western and Mountain Bluebirds, Chipping, Song and White-crowned Sparrows. Anyone is welcome to join this family-friendly ½-day trip. We will walk at least 2.5 miles on level trails observing what is on several large ponds and in the surrounding habitat. Meet at Mitchell's Grocery Store in Cheney at the east end of the parking lot at 8:00 am. Be prepared for possible inclement weather. Bring snacks, water, binoculars (scope and camera, if you have them). 25 years ago Cooper’s Hawks began colonizing urban & suburban landscapes throughout the US, evolving a tolerance for living in proximity to humans. Ed Deal, from the Urban Raptor Conservancy, will provide insights into these common but elusive raptors, covering the breeding season with photos and videos. The Seattle study, one of several in large US cities (e.g., Tucson, Milwaukee, Albuquerque), is monitoring the local population nesting density and annual productivity. In addition, a color ID banding program looks at fledgling dispersal, longevity, and adult breeding site and winter site fidelity. The results include annual increases in productivity, little evidence of migration, strong site fidelity and (mostly) short natal dispersal distances. Edward A. Deal, President and interim Treasurer, has been studying birds of prey for 25 years. He holds a master banding permit with the USGS Bird Banding Laboratory and a scientific collection permit in Washington State, allowing him to trap and band raptors. 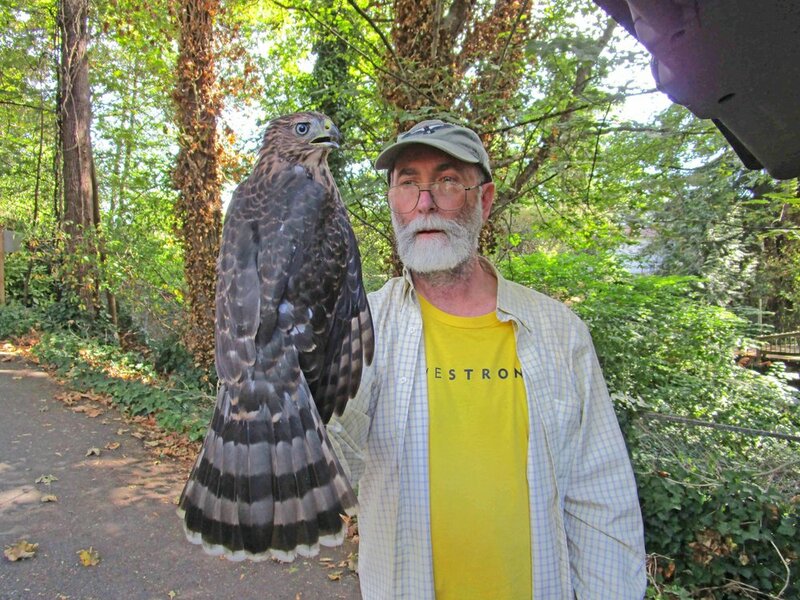 He directs two long-term studies of urban raptors in the Seattle area, on Cooper’s Hawks and Peregrine Falcons. Ed presents the results of our long-term Cooper’s Hawks study to community groups and university classes throughout Washington State. He is the lead author of a 2017 publication in The Journal of Raptor Research on Cooper’s Hawk behavior and is a coauthor on the chapter on urban-nesting Peregrine Falcons in the forthcoming book Urban Raptors (Island Press, June 2018). This is a half-day walking trip (about 5 miles) along a primitive trail through open Ponderosa pine scab rock country with many views of seasonal wetlands. All levels of birders are welcome. The Slavin Ranch is a Conservation Futures acquisition located about 10 miles south of downtown Spokane and a mile west of Hwy 195. We will start at the Slavin Ranch parking lot at 7:00 AM and end about 1:00 PM. Please call or text Alan at (509) 999-9512, or email at ahm2352@gmail.com by May 8 if you plan to attend. Remember to bring water, snacks and your optics. If it is a wet year, bring muck boots. Target Species: Breeding ducks and geese, raptors, Sora, Killdeer, Wilson's Snipe, Black Tern, woodpeckers, swallows, Eastern and Western Kingbird, House Wren, Song and Savannah Sparrow, Yellow Warbler, Common Yellowthroat, Orange-crowned Warbler. Contact: Ann at agbmaelstrom@gmail.com and she will send a confirmation email. Please include your cell phone number in case we have to cancel the trip at the last moment. Trip Description: Mostly birding along the road. One short walk may be muddy if we have had a lot of rain. What to bring: Bring your binoculars and some water and snack if desired; rain gear if forecast indicates it will be needed. Jenny and I will both have a scope; bring yours along if you like. The trip will be completed by noon at the latest. There will be no bathroom facilities on this trip (except at the Yoke’s). Description of Habitat and Target Species: We will walk up the rise to overlook Peone Prairie Wetlands where we should find several species of waterfowl as well as both red-winged and Yellow-headed Blackbirds – often a raptor will soar overhead. At Deadman’s Creek we will see if our faithful Calliope Humming has returned again. Here we often see Bullock’s Oriole, Eastern Kingbird, swallows and raptors. Then we will head toward Mt Spokane in search of Lazuli Bunting, Gray Catbird, Ring-necked Pheasant, Wild Turkey, Cedar Waxwing, woodpeckers and finches. This outing is billed as “kid friendly” with the emphasis on fun, some exercise and an introduction into birding. We’ll have our grandkids Aaden & Kolton who are 9 & 8 years with us, who have been birding with us for the past couple of years. We will meet at the Turnbull Wildlife Refuge HQ parking lot at 8:30 AM. Plan on being out for about 2 hours. We’ll be walking the Pine Loop Lakes route and around the hiking trails by the Wildlife HQ. Please bring binoculars, cameras, etc. If you don’t have this equipment, we’ll have scopes and a couple extra pairs of binoculars available for those who need to borrow some. Our goal is to identify birds and educate the kids & their families about birding and the rich experience it provides. Contact Richard at contactme@richardsollie.com or 509-981-9003 to register or if you have questions. Target species: A variety of ducks and geese, and possibly some swan. In addition, a variety of songbirds, such as bluebirds, swallows, chickadees, nuthatches, and blackbirds. Contact: leader Michael Woodruff - text 509-496-7973 or email mkd.woodruff@gmail.com by Saturday, May 25 to confirm your place. We will meet at the parking lot at the base of Iller Creek. Park on right before the switchback at the entrance to the Conservation Area. The Iller Creek Conservation Area is on both the right and left of the creek (coordinates: 47.5977135,-117.281971). Description: This will be a slow hike on moderate terrain covering up to 4 miles round trip and will require some level of physical fitness. The hike will likely last 3-4 hours. We will search for an impressive assortment of spring and summer woodland and riparian species. This is prime time for maximum species as many migrants are still moving through, and most breeders are back. Target Species: Ruffed Grouse, Calliope Hummingbird, Red-naped Sapsucker, Dusky and Hammond's Flycatchers, Cassin's and Warbling Vireo, 3 species of chickadees, Veery, Swainson's Thrush, finches, sparrows, Lazuli Bunting, and a chance at all of the breeding and spring migrant warblers. This is an overnight trip. Meet at the LPO NWR Ranger station between 5-6 pm Friday June 7. We will set up camp and bird a bit in the afternoon and then that evening we will try to find some owls – Flammulated, Western Screech and Northern Saw-whet. Saturday morning we will bird until it’s time to head back home. For those who don’t want to camp there is lodging in nearby Colville. The walking we do will be on mostly flat terrain. Target Species: Wood Duck and an assortment of waterfowl; Western Screech, Northern Saw-whet and Flammulated Owl; Common Loon; Red-necked Grebe; Ruffed Grouse; Sora and Virginia Rail; Wilson's Snipe; Common Nighthawk; All 3 hummingbirds; Red-naped Sapsucker; Black-backed and White-headed Woodpeckers; a nice variety of flycatchers, thrushes, warblers and sparrows. This is a mostly easy walking half-day trip. Liberty Lake hosts some of the best habitat diversity in Spokane County, extensive wetlands and prairie, old second-growth Ponderosa pine, and some of the best wet-belt mixed conifer forest in the area. Contact: Joyce Alonso (939-0120) by June 3rd if you plan to attend and for time, place and carpool details. The Othello Sandhill Crane Festival today announced the 2019 theme as “Elegant Travelers on a Journey”. The 22nd annual festival will be held March 22, 23, 24, 2019 in Othello Washington. With the celebration of the spring migration of the Sandhill cranes, the festival offers a variety of events for the whole family to enjoy and learn. Online registration opens on February 1, 2019. Visit https://www.othellosandhillcranefestival.org/ for more information. Visit https://www.wingsoverwaterbirdingfestival.com/ for more information. Put the info about the speaker here. Welcome to the 2019 Stanwood-Camano Snow Goose & Birding Festival which will be held on February 23rd & 24th. Come see why the shores and waters of Puget Sound surrounding our community are internationally recognized as crucial habitat for countless birds of sea, shore and land. Tours and guides will help you experience one of Western Washington’s most spectacular natural events – the annual winter gathering of thousands of Snow Geese and Trumpeter Swans. In addition we have flocks of wintering seabirds and shorebirds along with many raptors that call Stanwood and Camano home. Festival headquarters is the Floyd Norgaard Cultural Center in Stanwood, WA. Space is limited for bus tours – registration will be open soon. Visit https://discoverstanwoodcamano.com/calendar/snow-goose-festival-2019/ for more information. Bird watchers of all ages count birds to create a real-time snapshot of where birds are. Go to http://gbbc.birdcount.org/ for more information. We hold monthly meetings from September through May on the second Wednesday of the month. The public is invited and welcome to attend these monthly meetings. The monthly social gathering starts at 7 p.m. and the general meetings start at 7:30 and usually features an informative presentation. During our social half hour we hold a drawing for bird- related prizes . Tickets $1 each, 6 for $5. Three prizes each meeting. Money brought in goes to support our work. Please bring items to donate for the prize table! From Division Street go about 12 blocks East on Mission Ave. Just before the bridge over the Spokane River (by Avista), turn left (East) on Upriver Drive. Go 3 long blocks and turn left (North) on Crestline Street. Go one block. Turn right onto E. North Crescent Ave. Proceed a short way and take a left into the second of the driveways to the Community Building. The Community Building is straight ahead at the end. There are about 15 spaces to the left of the building and about 8 to the right. If these are full, you may have to park on E. North Crescent Ave.
Nick will discuss the normal antler growing and hardening process, abnormalities and deformations, as well as the mating season and shedding process. Also he will explain the shed hunting process that has become a sizable industry importing antlers from all over the U.S., Canada and Alaska, even South America. Nick has a lifelong interest in hunting, collecting shed antlers, etc. In 2008 he started “Custom Antler Designs. Much of his work is sold on Etsy. He makes antler chandeliers and lamps, as well as smaller items. Among the smaller items Nick makes are Antler Chew Toys for Dogs. Dogs love the bone marrow in these treats and chew toys. When choosing for your dog, density makes a huge difference - the darker, denser antler will be the hardest; the lighter, faded horns with small cracks are the softer, more easily eaten treats.